Brazilian President Dilma Rousseff delivered a scathing address decrying the National Security Agency’s (NSA) espionage activities at this week’s United Nations’ general assembly. 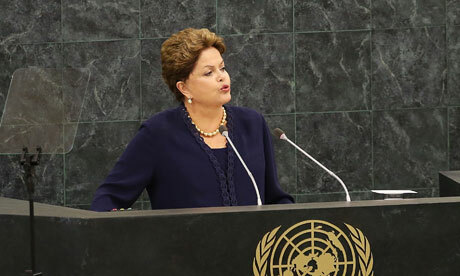 In her speech, made shortly after she called off her diplomatic visit to Washington, Rousseff said NSA practices were a “breach of international law.” Rousseff, imprisoned and tortured herself for opposing Brazil’s military dictatorship in the 1970s, said, “[a] sovereign nation can never establish itself to the detriment of another sovereign nation. The right to safety of citizens of one country can never be guaranteed by violating fundamental human rights of citizens of another country.” President Obama spoke directly after the Brazilian address, saying the US was beginning to review the NSA’s intelligence gathering programs in order to protect shared privacy concerns. Joining the Brazilian president in international criticism of the NSA is the European Union (EU), which is contemplating suspending its data sharing deal with the US that tracks terrorist funding. The US pushed heavily for the development of the joint tracking program, agreed upon in 2010, which requires EU members to transfer information from a Brussels system that amalgamates global financial transaction data directly to the US Treasury for analysis. EU representatives have said they will not continue the joint program until they receive satisfactory explanations from the NSA about its practices. While NSA head Keith Alexander accuses the media of “hyping” reports of the agency’s activities, a declassified NSA history obtained by the Archive is a timely and essential reminder of how easy it is for the agency to abuse its massive surveillance abilities. The Archive’s William Burr and Archive colleague Matthew Aid obtained the history that reveals, for the first time, some of the eye-popping names the NSA targeted during the Cold War in its effort to spy on suspected critics. The document not only lists the NSA’s famous targets, like Senators Frank Church (D-Idaho) and Howard Baker (R-Tennessee), Muhammad Ali, and Martin Luther King, it also provides surprising details on the Panama Canal Treaty, the Berlin Wall, and the NSA’s Minaret program, whose complete ‘watch list’ the Archive just submitted a FOIA request for. The ex-FBI agent responsible for leaking details of a Yemeni al-Qaeda bomb plot to the Associated Press (AP) last year will plead guilty to revealing secret information. The AP initially reported the bomb plot story last May, quoting an unnamed government official. A year later the Department of Justice informed the news source that the DOJ had secretly obtained nearly two months of AP phone records. The seizure was part of the Obama Administration’s aggressive campaign to plug leaks of government information, and was heavily criticized as an intimidation technique aimed at investigative journalists. For further reading, here is a complete list of the 11 Americans charged under the Espionage Act for leaks to the media. Archivist Kate Doyle testifies (photo credit: Saul Martinez). Finally this week, Archive analyst Kate Doyle testified as an expert witness in the trial of Col. Héctor Bol de la Cruz, the former Guatemala National Police director, and his subordinate, Jorge Alberto Gómez López, for the 1984 disappearance of student and labor leader Edgar Fernando García. 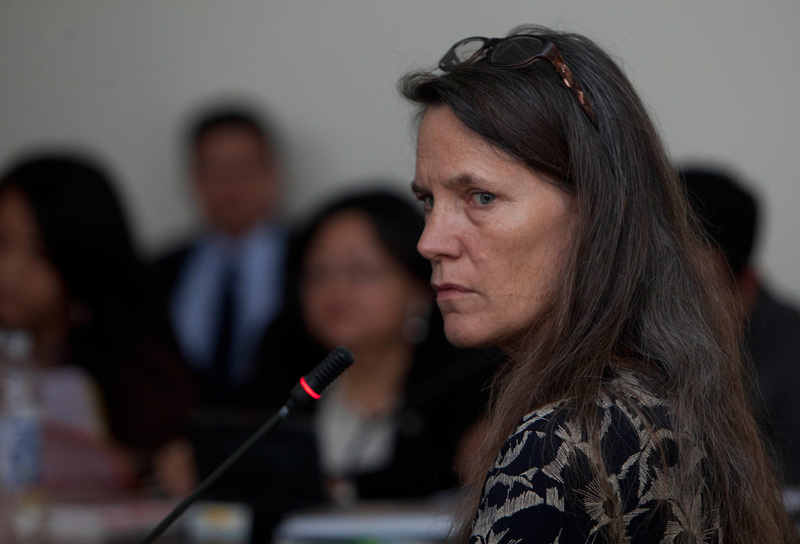 Doyle was asked to analyze declassified U.S. documents relevant to the case that were obtained by the Archive thanks to a series of targeted Freedom of Information Act requests, aiding in the conviction of the “intellectual authors” of forced disappearances throughout Guatemala. Well done, Kate!